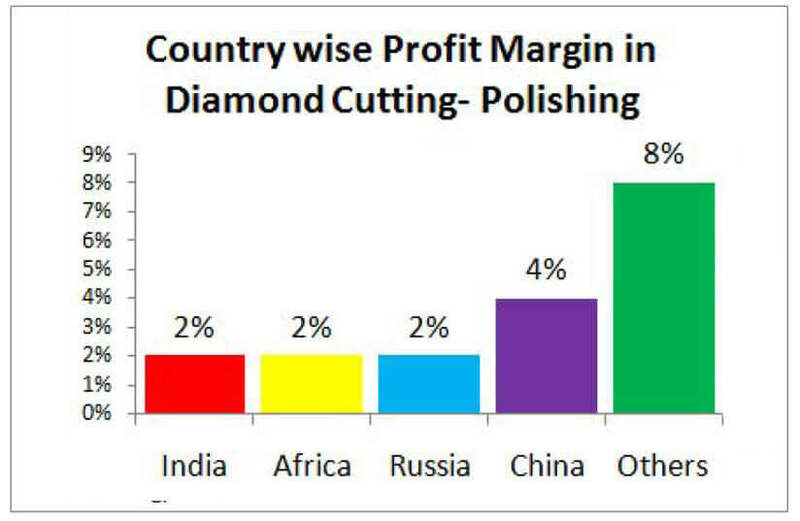 According to Antwerp World Diamond Center and Bain & Co. market research, Cut- Polish diamond and Jewellery Manufacturers have only 0% to 3% of the profit margin. Cut- Polish diamond and Jewellery Manufacturers are not robust enough to sustain against short-term fluctuations in the market. Cut- Polish diamond industry and Jewellery Manufacturers unconsciously or deliberately bear risks of price volatility that their business models cannot support. They must reevaluate their business models to improve operation efficiency. There are around 5000 plus players of diamond cutting and polishing and 10000 plus players of jewellery mfg companies. Cutting and polishing segment (including trading) represents traditional competitive market . 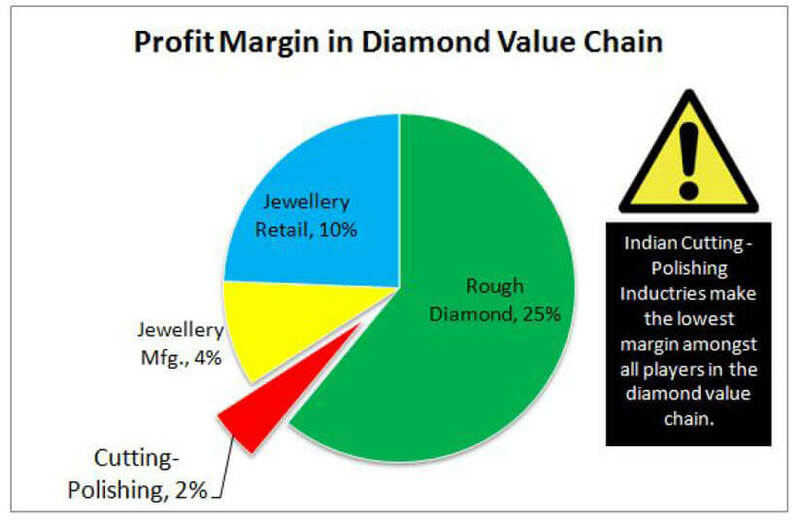 Looking to this situation, it is very clear that Diamond and Jewellery manufacturing companies are in tremendous pressure to improve operational efficiency. Cost = Making everything with least cost Since diamond industry has very less bargaining power with buyers and customers, they have to reduce internal cost of operation. 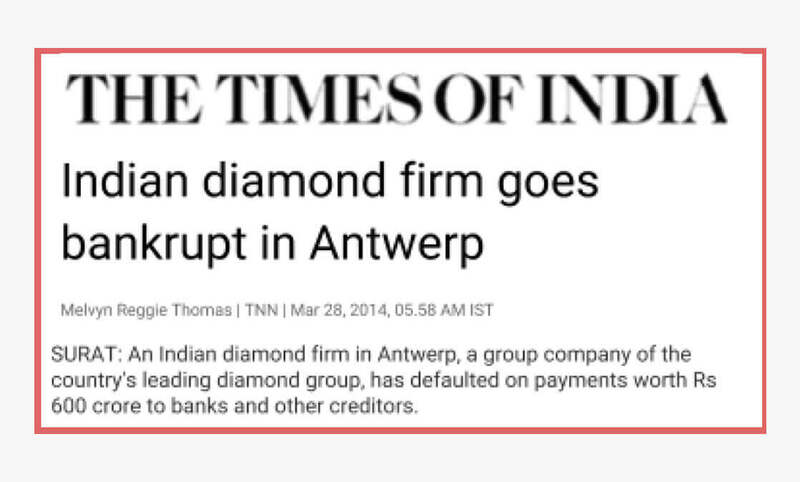 Let’s understand why we get such news in Indian Diamond and Jewellery company very often? There are five forces that determine competition in any industry. Industry Rivalry. In diamond cuttingpolishing and jewellery industry, all competitive forces are very powerful and hence the industry is very less competitive. 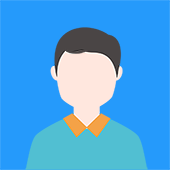 How to improve Operational Efficiency? Decide Key Performance Indicators (KPIs) for each function. Decide 3 to 5 years goals to be achieved. Decide 1 year goals to be achieved. Decide Operational Efficiency projects to be executed. Impart training on improvement tools and concepts like Lean, Six Sigma, TPM, VSM, Cell Mfg. etc. Execute improvement projects in logical phases (Define, Measure, Analyze, Improve, Control) or PDCA (Plan-Do-Check-Act). Definition of Quality has to change. India makes finest diamonds in the world, but here we are not talking about the quality of final diamond. There is lot of internal rework before finest quality of the diamond is made. 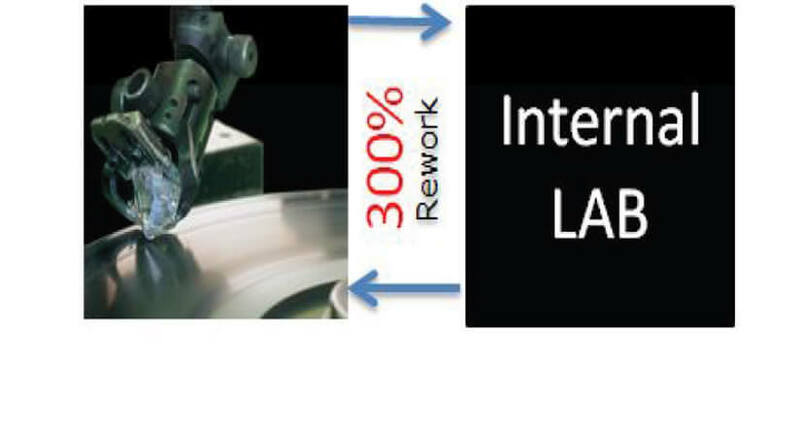 In one case study, we observed that diamond from polishing to internal laboratory was going to and forth 300%. Meaning every diamond is processed 3 times. The definition of the quality has to be “Right First Time”. If we go by this definition, then there is lot of rework in diamond industry. Example of Operational Efficiency improvement projects?